Packing, loading and unloading is nothing new for the Abante colleagues. This time our routine was met by an extra excitement but also some sadness. There was the excitement of meeting former colleagues Louisiana & Antoine Michel, and the sadness of coming to the realization that this was the last European trip as a team. It felt surreal, but everyone was determined to give it their all and go out with a bang. Upon arrival, we were received with an enthusiastic “bonjour!” by Antoine’s parents, Patrick & Florence Michel. Their greeting was only the beginning of a beautiful relationship that would soon be produced throughout the week. Their kindness was radiating through each activity we did together. The Michel family recently planted a church so the week started off with the team teaching workshops. Our Intern Leader Quay Jennings led “Active Listening,” and “Enemies of Unity.” Colleagues Katie Anna Sosebee taught “Teaching the Word of God to Children,” and Franchesca Martinez shared “Effective Facebook Marketing for Churches.” The Michel’s family eagerness to learn was inspiring. We were honored to know that they invited us to teach them. Soon after, they were teaching us. They gave us the ‘grand tour’ and shared the rich history of their beautiful city just a day before attending the “Marche pour Jésus” or March for Jesus. This march takes place across several cities in Europe in order to display the love Jesus has for people. Thousands of people unite in order to evangelize, dance, pray, sing, shout and share friendly smiles with people all across the city during this very hot 2-hour walk. The team was eager to be a part of this powerful movement alongside people from several denominations. Although everyone was very aware of the heat and their throbbing feet, the team maintained their excitement for an evening service in a small church near the city plaza. Emily Frost and Joshua Flaherty shared their ‘sacred story,’ and Gabriel Martinez preached. As the night came to a close after long talks and getting-to-know-you conversations, there was the reminder once again that this year was coming to a close. Each colleague now has added members in their international family- the Michel family and the people of their church. In a week full of evangelization, edification, and friendship-discipleship, the takeaway was nothing short of remarkable. The team was prepared to serve, and each encounter provided motivation to take home what they have learned and experienced. It was a great experience to be able to catch up with my colleagues from last year. Not only did it give us time to talk but it also gave me a chance to see how much has changed since last year. 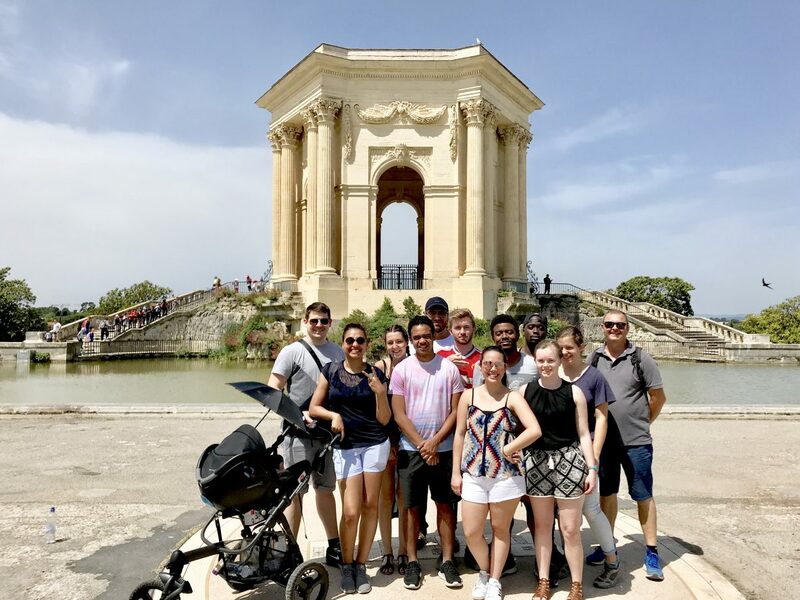 It was nice to see the architecture, nature and all-around physical beauty of Montpellier, but what I found most value in was building relationship with our hosts, their family and the people we met. Seeing what Lou & Antoine are doing after leaving Abante stirred up even more excitement about doing things I have a passion for back home! I feel motivated to go back home and serve my big Texas family. I really enjoyed the Mediterranean landscape of southern France. I loved the way our hosts shared their lives with us and wanted to connect with us even though it was hard for them to speak English. France was a beautiful place to visit. The people I met were so amazing and very hospitable. The March for Jesus was a once-a-year experience which seemed to create a large response from people on the streets. I really enjoyed my time in the south of France. The ministry, the people, and the location were all amazing to experience. You are very beautiful persons because God gaves you a lot of His Grace that you transmitted to us with love ! God bless you !! !